We invite you to take part in this research study because you have advanced gastric cancer. We give you this consent form so that you may read about the purpose, risks and benefits of this research study. Standard care is based upon the best known treatment and is provided with the main goal of helping the individual patient. The main goal of research is to gain knowledge that may help future patients. You have the right to refuse to take part, or agree to take part now and change your mind later on.Whatever you decide, it will not affect your standard care. Your participation is voluntary. 1- Why Is This Research Being Done? Scientists are continually looking for better cancer therapies. Therapies that will lengthen your life and also improve the quality of your life. Previous research studies have shown docetaxel (Taxotere) to be effective in the treatment of several types of cancers. Docetaxel is presently approved by the Food and Drug Administration for the treatment of breast and lung cancer. 2-What Is The Purpose Of This Study? Stomach cancer is the second leading cancer (after lung cancer). Cure for patients with gastric cancer is only available for those in whom a complete surgical resection can be performed. This is possible in only 30-35% of all patients and even in these patients, relapse is common. Advanced disease is incurable and patients are treated with chemotherapy. At present there is no standardized therapy regimen. Cisplatin and 5-FU are commonly used in the treatment of gastric cancer. The aim of this study is to determine if there is an advantage to giving docetaxel with cisplatin and 5-FU. The Phase II portions of this study, that is now completed, determined that docetaxel given with only 5FU was less effective and have chosen to continue the Phase III portion of the study using docetaxel with cisplatin and 5-FU as the experimental regimen. 3-Who Is Doing The Study? Dr. James Holland, M.D. directs this study at the Stratton VA Medical Center. This study is a multi-center multi-national study that is sponsored by Aventis Pharma. As many as 610 patients throughout the world may participate in this study. It is expected that the Stratton VA Medical Center will enroll approximately 10 patients. 4-What Will Happen To You If You Take Part In The Study? Prior to receiving any treatment the doctor must determine if you are eligible to participate. in this research. Dr. Holland will ask you to have the following tests and examinations performed: Eligibility Tests: complete medical history, physical examination, electrocardiogram (EKG), blood test (approximately 2-3 tablespoons of blood), quality of life questionnaires, x-rays or scans (computerized tomography and/or bone scan). 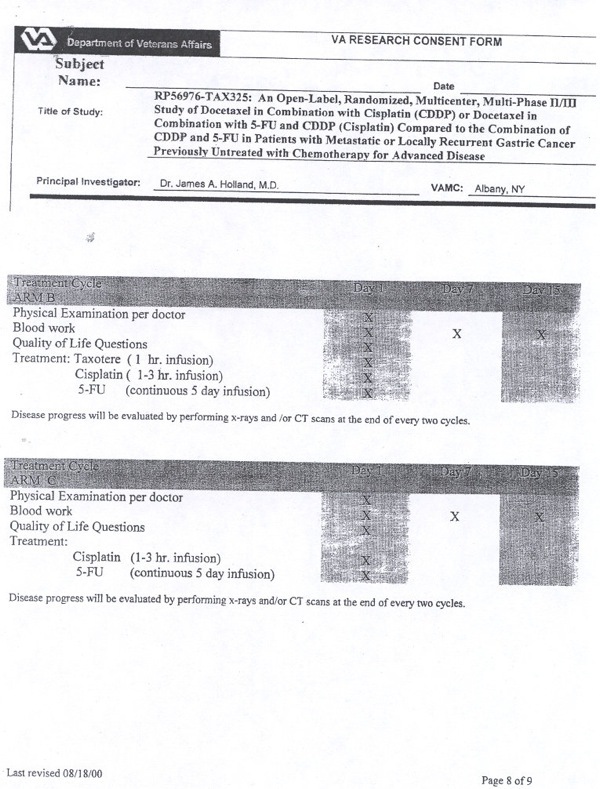 These tests are all routine tests that would be done prior to you receiving any chemotherapy. A urine pregnancy test must be performed on women of childbearing potential. Docetaxel and the other study drugs may be harmful to an unborn child carried by a mother who is receiving one or more of these drugs. Men and women will be asked to use acceptable forms of contraception such as birth control pills, condoms, diaphragm, contraceptive implants, or spermicidal agents. Testing during each cycle (see the attached schedule): The physical examination will be repeated every three weeks while you continue to receive treatment and four weeks after your last treatment. The blood tests will be repeated every week during the treatment cycles and approximately four weeks after your last treatment. The x-rays or scans will be repeated after every two treatment cycles (every 6 weeks) and every two months after you have received your last treatment. If you meet all the entrance requirements for this study, you will be randomly assigned (like the flip of a coin) to one of the two treatment groups. You will have an equal chance of being assigned to either of the two groups: (1) docetaxel with cisplatin plus 5-FU, or (2) cisplatin plus 5-FU. Neither. you nor your physician will have any say in determining the group you are assigned to. You will remain on that regimen throughout your participation in this study. You can receive up to six cycles of treatment on this study. The status of your disease will be checked after the second, fourth, and sixth cycles to determine if you should continue participation in the study. If these test show that your disease is continuing to grow, you will be immediately removed from the study and other treatment options discussed with you. You will receive your treatment in the outpatient clinic. On the weeks that you are not receiving treatment you must return to the clinic for blood work. Your doctor will monitor your condition closely. He will see you prior to starting each cycle and whenever necessary during the treatment cycles. All patients will need to have a central venous device (which is a catheter) inserted. A catheter is inserted through your chest into a large vein. This device is required for the administration of the 5-FU. This will require an additional outpatient hospitalization for the insertion of this catheter by a general surgeon. This procedure is done under local or general anesthesia that is carefully monitored. Having a central venous access device requires clinical visits every 6 weeks for flushing when it is not in regular use. The device may stop working properly and have to be replaced. Once initial healing has occurred (approximately a week), there is usually no discomfort associated with having one of these. Although uncommon, the risks associated with having a central venous device put in are infection, bleeding, and a collapsed lung. The doctor putting the device in will discuss these risks in detail with you prior to having the device inserted. cisplatin the continuous infusion of 5-FU will be started and will infuse through your central venous access device for 5 days. A small infusion pump that fits in a carrying case will be used for the continuous infusion. You will be required to carry this continuously with you on these treatment days. At the end of five days the treatment will be completed. You will need to return to the outpatient clinic to have the infusion pump discontinued. This regimen will be repeated every 3 weeks. If you are assigned to receive cisplatin plus 5-fluorouracil (5-FU) (group 2): As described above but you will receive only cisplatin and 5-FU. Other medications will be given as needed in order to avoid, reduce or delay unwanted side effects (nausea/vomiting, fluid retention, and kidney dysfunction) of the combination treatment. You will be given extra intravenous fluids (through a vein) throughout the treatments, to insure a good urinary output. This will prevent bladder irritation from the cisplatin. You will be asked to take dexamethasone (an oral corticosteroid), 6 total doses over 3 days, starting one day before the docetaxel infusion. This medication will help with nausea/vomiting, fluid retention, and decrease the chance of allergic reaction to the docetaxel. The dose of any of the treatment drugs may be reduced or delayed if you develop severe side effects from the treatment. You will receive the drug combination approximately 6 times (6 cycles), or more if your physician feels that your condition has benefited. You will be asked to complete a "quality of life" questionnaire prior to starting each cycle and periodically after you have completed the treatment phase of the protocol. These questions concern aspects of you life (daily activities, symptoms of your disease, mobility, self care issues, pain/discomfort, and depression) that are being influenced by your disease and the treatment you are receive. Many of these questions are very personal and you have the option not to complete them. 5-What Are The Possible Risks and Discomforts? The infusions themselves may cause temporary irritation and bruising at the site. Among known side effects of docetaxel are short lasting mild to moderate nausea and/or vomiting, fatigue, weakness, weight gain and fluid retention, swelling of the limbs and/or face with or without fluid around the lung or abdomen, mouth and stomach irritation, diarrhea tiredness, reversible numbness and tingling in hand or feet, hair loss, skin reactions, allergy which needs close monitoring during the infusion, and temporary changes in blood tests which may render you more prone to infection and bruising. Among the side effects encountered with 5-fluorouracil (5-FU) treatment: nausea, vomiting, diarrhea, mucositis (mouth irritation), fatigue and weakness, skin reactions, hair loss, changes in the production of red blood cells, white blood cells, and platelets (as described earlier). There have been reported effects on the heart such as myocardial ischemia (decreased blood flow to the heart) that is usually identified with angina (chest pain). Cisplatin has been available for cancer patients for several years. The side effects are well known. Nausea and vomiting occur in almost all patients; vomiting begins within 24 hours and may last up to 24 hours. Effects on blood have been observed: these include a decrease in white blood cells, making patients more open for infection; and a decrease in platelets (a part of the blood that makes it clot), which can lead to easy bruising and bleeding. A decrease in red blood cells may occur in some patients giving symptoms of shortness of breath, weakness, and fatigue. The effects on blood can be helped with medications and/or blood transfusions, if necessary. If you develop signs of infection (e.g., fever), you may need to be hospitalized for treatment with antibiotics. Kidney problems may occur, but prevention by using adequate fluids before, during and after chemotherapy helps . Nearly all patients develop paresthesias (tingling sensation of the skin) and in about one third, it is longlasting. Hearing may be affected, as demonstrated by tinnitus (ringing in the ears) and high frequency hearing loss. Hypersensitivity (allergic) reactions occasionally occur in previously treated patients. These may present with symptoms such as tachycardia (rapid heart rate), confusion, agitation, wheezing, low blood pressure, and/or facial swelling within a few minutes of IV administration. Skin damage may occur (tissue death, infection or tissue thickening) as a result of the drug leaving the vein during infusion. Other less common side effects: increased uric acid (a product of protein break down), short-term liver enzyme elevations, inflammation of the pancreas, and possibly tetany (spasm) associated with loss of minerals through the kidneys - calcium and magnesium. You may experience none, some or most of the side effects listed above, but it is unlikely that you will experience all of them. You will be watched closely through out your participation in this study and the drugs will be stopped if serious or life- threatening side effects develop. In addition to the risks listed above, you may experience a previously unknown risk or side effect. Other possible discomforts that may occur with procedures include mild discomfort and/or bruising at the site of the blood draws and the infusion sites. Possible risks associated with the insertion of the central venous device are infection, bleeding, and collapsed lung. These risks will be discussed with you in detail by the surgeon placing the device. An increased number of diagnostic imaging procedures (x-rays, CT scans, Nuclear Medicine scans, etc.) may be required by this research protocol that could expose you to more radiation than would be considered standard care for your disease. However, the risk of radiation exposure in a diagnostic procedure is uncertain and has not been definitively determined. 6-What Are The Possible Benefits? We cannot promise any benefits from your being in the study. All drugs in the study have been shown to have anti-cancer activity in both humans and animals and thus a possible benefit would be the shrinking of your tumor, relief of symptoms and/or prolongation of life. However, taking these drugs could also be potentially harmful due to the side effects discussed above. It is not possible to say whether you will personally benefit from participation in this study, although knowledge gained may benefit others. 7-If You Do Not Want To Take Part In The Study, Are There Other Choices? You have the option not to participate in the study. Alternative treatments for your disease may include supportive care or drugs and/or drug combinations similar to those used in this study which are currently approved by the U.S. Food and Drug Administration for the treatment of gastric cancer. Your doctor will provide you with detailed information about your disease and the risks/benefits of your options. 8-If You Have Questions or Problems, Whom Can You Call? If you have any questions about the research now or later, or if you think you have had a research?related injury, you should call Dr. .Tames Holland, M.D., whose telephone number is (518) 462-3311 x. 3067. After hours please call (518) 462-3311 and have the operator contact Dr. Holland. If he is not available, you may call Dr. Donald Pasquale, Chairperson, Human Studies Subcommittee at (518) 462-3311 x. 3070 or Dr. Patricia Phillips, Ph.D., Acting-Associate Chief of Staff for Research and Development, Stratton VA Medical Center, Albany, New York, (518) 462-3311 x. 2254. 9-What Information Will Be Kept Private? We will keep research records that identify you private to the extent allowed by law. The Food and Drug Administration, Stratton VA Medical Center Institutional Review Board, and an authorized representative of the study sponsor, Aventis Pharma, however, may inspect and/or copy the record that identify you. Records of tests/procedures to monitor your cancer may be sent to a central office for review by an authorized representative of Aventis. However, these records will remain confidential. Results of the study may be published; however, your name and other identifying information will be kept private. Your name said any material identifying you as a study participant will not be, released without your permission, except as such release is required by law. 10-Can Your Taking Part In The Study End Early? Participation in this research is voluntary, you may withdraw from the study at any time without penalty, loss of benefits, or reduction in the quality of your medical care by informing Dr. Holland of your desire to withdraw. Dr. Holland or Aventis may withdraw you from the study without your consent. The reasons you may be withdrawn include: change in laboratory values, any medical condition that the doctor feels may compromise your health, discontinuation of the study by the drug company, or a worsening of your cancer as shown on x-ray or scan. If you withdraw from the study for any reason, it is important that you return for your follow-up visits and continue to have your disease progress monitored. We will provide you with any information that becomes available during the study that might affect your decision to stay in the study. 11-What Else Do You Need To Know? If you participate in this research study, you will be required to pay your usual VA co-payments. The Albany Stratton VA Medical Center will provide medical care and treatment to eligible veterans for any injury incurred as the result of participation in this study. Compensation for such an injury may be permitted by applicable Federal laws and/or regulations. Non-eligible veterans and non-veterans injured as the result of participation in this study may receive only humanitarian emergency care. Compensation for such an injury may be permitted by applicable Federal laws and/or regulations. 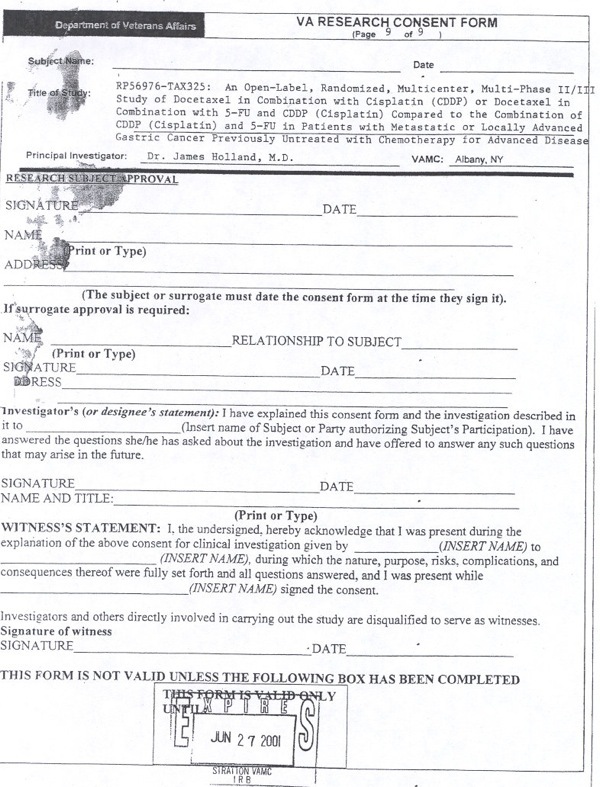 You will be given a copy of this consent form.